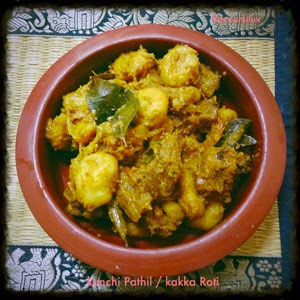 This exotic dish has an important role in our Malabar culinary. This is a delightful one pot meal to take as dinner or evening snack. 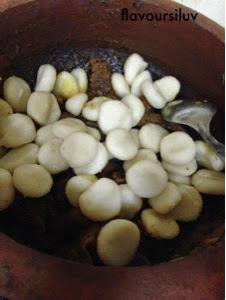 These are small rice dumplings steamed and cooked in the tasty meat and coconut gravy. In Ramadan, we prepare various dishes for each day and share with our neighbours. Kunchi pathil is one among them. If you are someone who loves tasty food, then try this one. Soak the rice in hot water for 4 hours. Grind it along with minimal water until you get a coarse and grainy mixture. Add fennel seeds, shallots and salt into this and grind for few seconds. Hang this mixture in a muslin cloth to remove excess water, take a small portion of the dough and shape it. Steam cook this dumplings for 8-10 minutes until done. For making gravy, first pressure cook meat with half amount of turmeric, chilly, coriander powders and with little salt. In a pot heat oil, add onions and salt, saute till it turns golden. Add ginger and garlic and saute till raw smell fades. Add remaining powders, garam masala then add cooked meat along with stock. 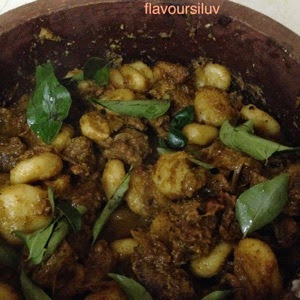 Stir well and cook till gravy becomes dry and meat coated with all masalas well. Add the cooked dumplings into the masala and mix well. Make a smooth paste with coconut, fennel seeds and shallots. 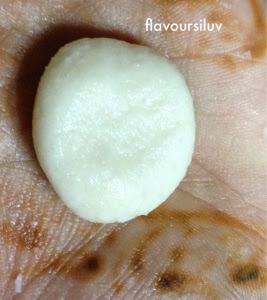 Add this paste to the meat and dumpling mixture, stir well and cook for another 5 minutes. Take it off the flame.